Who else is excited that the holidays are here! We just love the whole holiday season in our family and starting from Thanksgiving Day until New Years Day we are in holiday mode! We love to do family projects like baking and cooking, play games, watch movies and even build gingerbread houses! We all bake pies together to eat on Thanksgiving after our turkey dinner and that kicks us off! This year we are going to make some special desserts using Golden Crisp Cereal because everyone in our house loves this cereal! Our recipe is for the Golden Crisp Sugar Bear Squares, check it out! Melt butter in saucepan over low heat. Add marshmallows; stir until melted. Remove from heat; add cereal and nuts. Toss until well coated.Press into greased 13 x 9 pan. Chill 1 hour. Cut into squares. Store in cool place. Makes 24 squares. When getting ready for shopping for your ingredients you can download a coupon for Golden Crisp here! Yummy!! After we have had dinner we usually sit around eat our desserts and play cards or other games just to bond with family. Our family also loves going to the movies, we have seen so many movies between Thanksgiving and Christmas over the years, it just seems to be something we all can enjoy together during the winter weather. I am so excited this year to see the new movie Sing©. Maybe we will even take our Golden Crisp Sugar Bear Squares with us to snack on! Following the release of this summer’s comedy blockbuster The Secret Life of Pets, Illumination presents Sing this holiday season. The movie is set in a world like ours but entirely inhabited by animals, with a premise like that you know its going to be awesome. The music is from so many great artists that I am sure it will keep everyone’s attention! 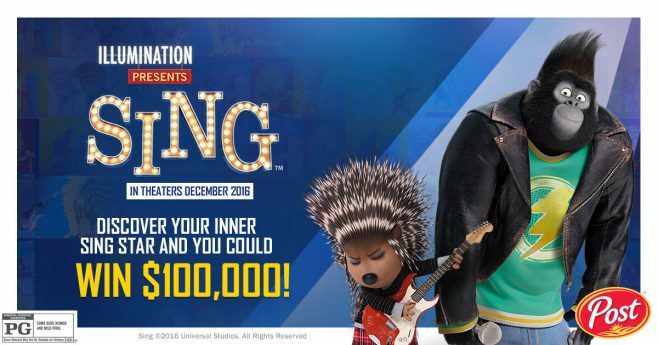 Post Golden Crisp is hosting a great Sing Movie Sweepstakes where you can win $100,000!!! Purchase participating Post Cereal Brands and enter the Sing Sweepstakes for a chance to win the $100,000 grand prize plus the chance to instantly win lots of prizes including movie tickets, speakers and more. How incredibly awesome would that be! You can enter HERE and check out all of the official rules and prize information here! © 2016 Post Consumer Brands, LLC. All Rights Reserved. winning, etc. Void where prohibited by law. Sponsor: Post Consumer Brands, LLC. This holiday season is going to be great! We are going to have our special baking time, some great movie time when we go and see Sing and just a wonderful time being with family! I hope you and your family will find some great things to do and bond together. Don’t forget to get your coupon for Golden Crisp and Enter the Sing Sweepstakes! Happy Holidays all! Next post: Cutest Pants EVER for Babies and Toddlers!